Lately, people are looking forward to discovering ways of staying healthy until a late age, which is nothing but great news. We all know how important is to pay your doctor a visit regularly or stick to a daily – if your schedule allows it – exercise routine, combined with a healthy diet. On the other side, it’s less known that proper massage therapy, conducted by a professional, can also have a huge impact on one’s health. In fact, let’s take a few moments and see which are the essential benefits of this type of therapy! There’s no doubt that this is one of the main benefits massage therapy comes with. It was scientifically proven that being constantly exposed to stress can increase the risk of heart disease, but also diabetes or hypertension, so getting massage regularly is pretty much one of the best things one can try in order to deal with what’s called “the disease of the 21st century”. A massage session can be an intensely relaxing experience, as you’re simply lying back and feel how the tension ‘living’ your muscles is immediately going away. The lack of sleep can also be a tremendous problem, affecting the majority of adults in the United States and leading to a range of chronic conditions, like cardiovascular disease, depression, diabetes, or even obesity. But guess what? Massage therapy can be one of the best solutions to it. By getting rid of muscle tension and setting a moment in the day when you slow down a bit, you can enter a prolonged state of intense relaxation, which can last long after the massage session. How many times did you analyze your diet? Just do it once and you’ll most likely notice that you are eating too much…salt. Yes, salt, and this has a negative impact on your blood pressure, placing a strain on the heart, leading to hypertension and increasing the risk of a stroke. It was proven that massage therapy can contribute to reducing high blood pressure, lowering systolic, as well as diastolic blood pressure. Also, according to recent research, it regulates the levels of cortisol, the hormone responsible for raising the pressure. Recent studies have proven that massage can significantly improve the response of the immune system. Specifically, people who started massage therapy admitted experiencing a notable spike in the production of lymphocytes, the cells responsible for protecting your body from diseases. Combined with its stress relieving ‘powers’, a massage session could be incredibly helpful for anybody who wants to maintain their immunity at top levels. So, supercharging your health through massage sounds like an excellent idea, don’t you think? If you’re located in the Clearwater area, Maria is the one who can help you. Combining multiple massage types, including Ashiatsu, Cupping, Deep Tissue, or even Warm Bamboo, with her modern anatomical knowledge and the philosophy of Asian culture, she is the one who can introduce you to massage therapy and its full benefits. Looking Forward To Losing Weight? Then Start Eating Less! One popular belief says that in order to lose some weight and obtain that slim look you always wanted, you need to exercise like crazy. Well, it’s time to bust the myth: That’s not true. You can lose more weight if you start eating less, instead of exercising. Actually, you can do it by paying more attention to what you’re eating and don’t exercise at all. The idea is simple: in order to lose weight, you need to burn more calories than you consume. Exercising consumes far fewer calories than many people think. Let’s say that you go for a 30 minutes jog. In that amount of time, you manage to burn less than 350 calories, as long as you have a constant pace, but more people can’t do this, so the amount of burnt calories is smaller. Sure, exercising has its benefits, but there are way more problems with it when it comes to relying on it to control your weight. And studies also confirm this. A 2011 meta-analysis – a study of studies, that is – found that being active is not actually the key determinant in whether a child reached an unhealthy weight. As for the adult population, studies had difficulties finding if a physically active person is less likely to gain excess weight than a person who can be considered sedentary. Besides all these, it’s important to mention that exercise increases appetite. Therefore, if you go for a jog – or any other type of exercise – it’s somehow difficult to lose weight if you can’t control your appetite, as your body will send signals, asking you to replace them. But we’re not saying that exercise and maintaining a good fitness state plays no role in your mission. Adding exercise to diets is definitely beneficial! The idea is to combine exercise with diet, for more sustained weight loss, but for longer periods, like at least a year. Studies have shown that doing this for shorter periods, like six months, made little to no difference. Therefore, why this belief that only by exercising you can drop some pounds? It’s actually very simple. A lot of people can manage to find at least an hour in their daily schedule to go to the gym, but complain that they don’t have the time to prepare a healthy meal, able to help them with their weight loss efforts. The truth is that if they would try spending just half the time they dedicate to exercising to prepare a healthy meal, they would see much better results. Last but not least, we need to mention one more aspect that has a big impact on your weight: stress. It is highly recommended to totally avoid it and your fitness can significantly improve. A great way to relieve the pressure of everyday life is through massage. Thanks to specialized training and years of experience, as well as an Asian heritage, Maria’s Professional Massage can help you obtain a healthier mind and body. Day by day, we keep seeing tons of ads for various products, promising to keep us looking as young as possible. Apparently, people are terrified by the idea of getting older and try to hide any signs age puts on their faces. Sure this can be done with make-up, intense training, a healthy lifestyle and, why not, some Botox. But these do cost. A lot. If you’re reading this while on a comfortable chair, you’re on the right path, as one of the most important things you can do is to give yourself a break from time to time. According to recent studies, stress causes physical changes in the body, thus accelerating the aging process. These days, there are stress factors all over, so the most effective way to break this destructive chain of events is to meditate. Even if it’s for as little as 10 minutes per day. Pick a quiet place, close your eyes, fully relax and breathe deeply. Then thank us in a few years. Besides helping you lose weight and being excellent for your health, regular exercise is also great for toning muscles, building healthier bones and – very important – boost your mood and help you think clearly. Actually, there’s a connection between physical exercise and better brain power! A few short workouts per week are a great start. Running, biking, swimming, you name it. If it gets you off the couch, your health can improve and you will stay young! Believe it or not, a study showed that mice on a high-fat diet supplemented with a substance found in the skin of grapes had way longer average lifespans than those who weren’t given the substance. Resveratrol, the substance we’re talking about, reduces the risk of diabetes and liver problem in mice, besides other benefits. So basically, if you’re drinking one glass of wine per day, you’re constantly helping it to maintain its health. Just make sure you keep it within the limits. This can be a pretty surprising piece of advice, but we’re actually talking about fats that are good for your health, like Omega-3 fatty acids, like the ones found in salmon. These play an important role in stabilizing your mood, as well as maintaining bone structure and helping prevent visible signs of aging, something we’re all after. As mentioned above, the best way to start this journey is to relax from time to time. Meditation can be great, but sometimes, nothing compares to a good massage. And Maria knows exactly how to reduce your stress levels and improve your overall health and well-being. Schedule an appointment today and embark on the road to obtaining a healthier body and mind. Let’s say that you’re at work and, suddenly, you begin to feel a pain caused by having sore muscles. At least one of your colleagues will suggest some magnesium supplements, in order to avoid such problems in the future. And you know what? This is actually one great solution! Technically speaking, the flow of magnesium and calcium through the muscle cells is the one that controls contraction and relaxation, so taking supplements makes total sense. Besides this, magnesium, along with minerals like sodium, potassium, and calcium, are lost through sweat, so a few magnesium supplements, after a workout, is very popular among athletes. But back to the initial question: can magnesium fix your sore back issues? Currently, there are no studies proving this, but this doesn’t mean that this solution should be ignored. “Scientists are now saying that cramping is related to neuromuscular fatigue in the exercising muscles so it’s not necessarily the low levels of a particular electrolyte that is directly leading to the cramp,” says Katherine Shone, spokesperson for Sports Dietitians Australia. Is it that good for your body? Every organ in your body – especially the heart, muscles, and kidneys, operate properly in the presence of magnesium, an essential mineral which also keeps our bones and teeth strong, but also assists with energy production. Therefore, it’s pretty obvious that an eventual lack of magnesium can have an impact on the well-being of your muscles, including the ones supporting your back. In order to get a sufficient magnesium intake, it’s highly recommended to consume fibre-rich foods. For example, one cup of kidney beans, black beans or lentils should provide around 25 per cent of the daily requirements, while an additional cup of rice is another 25 per cent. 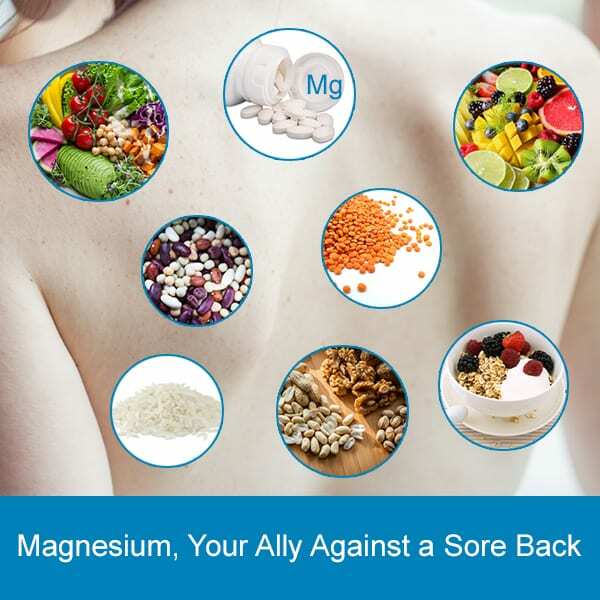 Overall, anybody who follows a healthy diet, including fruit, vegetables and nuts will surely have enough magnesium in their diet and manage to avoid suffering from a sore back. How bad is a lack of magnesium? There are situations in which people with chronic health conditions have a magnesium deficiency, meaning that back pain is something common for them. However, supplementation does the job and the pain is not that strong. Generally speaking, serious magnesium deficiencies are very rare, but, on the other side, borderline magnesium deficiencies are common. To wrap it up, if muscle cramping is your main issue and it’s affecting your back seriously, simply focus on fueling before a workout, then recover with protein, fruits and veggies. 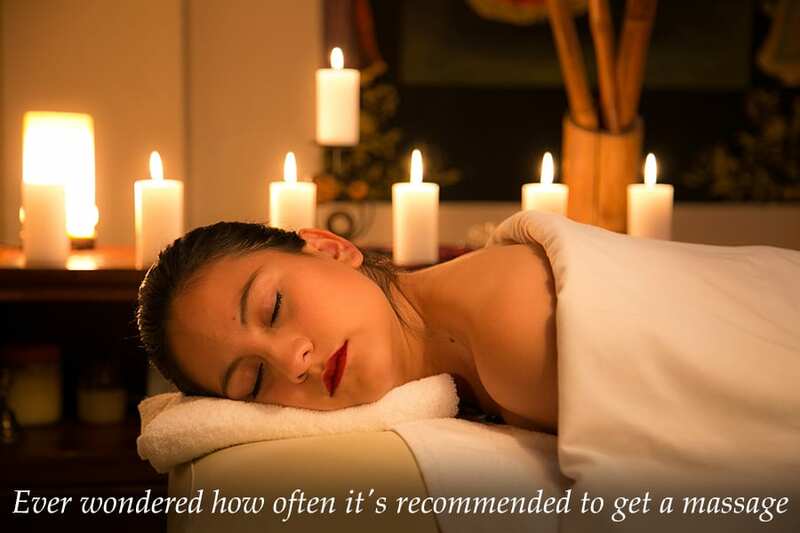 Or you can also opt for a professional massage service, like the one offered by Maria. Besides relieving from tension and stress and helping dissolving pain and discomfort, her services can help you improve your muscle tone and flexibility so that sore back that kept making your life hard. Considering how often people complain about having a life filled with stress and body fatigue, there’s no surprise that massage saloons have more clients than ever. And these are just two of the main reasons why people are relying on such services to feel better. If you’re a fan of massage yourself, however, you should be aware of a few aspects before deciding to put massage therapy into your regular wellness program. The frequency of your massage therapy completely depends on both your physical and emotional needs, but also your stress levels. Is getting a massage way too often bad? The idea is that getting a massage regularly – a few times a week, that is – will allow you to experience several health benefits. Still, this may not be right for each individual! For example, if you have some injuries causing you pain or other back pains, you definitely need to consult a physician and see what it’s recommended in your case. Also, if you’re hoping to get rid of any type of pain after one massage session, we have some bad news for you: just like going to the gym for one month isn’t going to get you that summer body you always wanted, getting a massage one-time won’t fix an aching body. If you’re hoping to get rid of muscle tension caused by poor posture, lack of exercise or stretching, or daily stress-buildup, regular visits with a massage therapist should become part of your routine. Ok, so it’s all set: you’ve made an appointment and are ready to experience your first massage session. The first thing you should do is to actually talk to your therapist. A great therapist should be a partner whom you trust and handle your body to, in order to ‘fix’ some of its problems. Take a few moments and discuss your goals, fitness routine, your physical background – make sure you mention any injuries you experienced in the past – and anything else which could affect the way your sessions go. By being open and honest with your therapist you will help them determine how often you should meet. Is there an exact number of recommended massage sessions per week? Generally speaking, it’s recommended to schedule massage therapy more often during periods when your stress levels increase or when you have to deal with stress and pain associated with physical and mental conditions. Also, if you know that you have an important event coming up, which can have a negative impact on your stress levels, it’s also highly recommended to schedule a few extra massage sessions. If you’re searching for an experienced therapist who can help you with this, Maria’s professional massage is one of the top services you can choose. With a diverse background and professional demeanor, she has a proven track record with a wide client base, located in Clearwater, Palm Harbor, Safety Harbor Florida and Tampa Bay Area.